for the people of Mandsaur, Dewas and Dhar districts of Madhya Pradesh drought has been a daily scourge that they learnt to live with. They would wait endlessly for water trains, lock barrels of water to prevent theft and protest sporadically against the scarcity. The recent drought, however, has made the government adopt a novel scheme in which it involved the victims themselves in conserving their lifeline. The scheme is simple. The district administration provides technical help and partly finances projects like construction or repair of talabs (ponds) and setting up of rooftop rainwater harvesting systems ( rtrwhs ). The people chip in with cash and labour. Dewas has virtually declared war against water scarcity. The collector, M Mohan Rao, said: "When I took over as district collector, I declared Dewas a 'water scarce district' and banned drilling of tubewells. The villagers were taught how to recharge wells and dig deeper tanks. Mining pits were also filled with water." However in Dewas, it is the rtrwhs that has succeeded more than anything else. Almost 1,000 systems have been installed here with 700 of them in towns and 300 in other areas. The patented Dewas filter, designed by Rao and engineers of the rural engineering services, are provided to users for Rs 600. Building permits are now issued only after applicants promise to install rainwater harvesting systems. Public programmes The chief executive officer ( ceo ) of the Zilla Parishad, Rashmi Shammi, said: "We started our campaign from the Karamchari Colony that had only 32 tubewells. We provided rtrwhs to 25 houses. There are 600 pending applications for filters." One of the first residents to install rtrwhs , A Lunavat says: "Earlier, it used to take 24 seconds to fill a bucket. After installing the system that is done in 16 seconds flat." 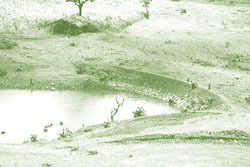 Under the Jal Hetu Bhoodan project, several ponds have been built on revenue land. Farmers with over 8 hectares of land were exhorted to donate a portion to build tanks. "These keep the moisture level of the fields intact and farmers have willingly given money for such tanks," says Shammi. One of the tanks in the Harnawad village now has 0.98 million cubic metre (mcum) of water. "The villagers lent their excavators for digging the tank. The black cotton topsoil was dug out and used for the bunds around the pond. The water level in the downstream area has risen and the moisture content in the soil also increased," says Shammi. In the predominantly tribal district of Dhar, 669 gram panchayats have approved the Mahabhagirathi drinking water plan prepared by 1,488 villages. Of these 1,210 are afflicted with water-scarcity. "The district has black cotton soil and black basalt that causes low groundwater recharge. As a result, about 2,500 handpumps have run dry during summer. In some places, groundwater recedes to a depth of 122 metres," says Rajesh Rajora, collector, Dhar. Drinking water crisis The district had about 2,300 handpumps in 1986 when the Rajiv Gandhi Drinking Water Technical Mission began. In the last 14 years, the number of handpumps has increased five-fold. Groundwater is now being increasingly used for private irrigation that has consequently dried drinking water sources. This year there has been a drought in Dhar with the total rainfall only two-third of the normal. This has aggravated the drinking water crisis. By March-end, 60 per cent of the handpumps in the blocks of Nisarpur, Nalcha, Kukshi, Umarban and Tirla had run dry. To combat the drought, wells have been repaired and desilted, new ones built; checkdams constructed, pumped water supply schemes implemented and water supply extended. Significantly, out of the total plan of Rs 7.22 crore spent on water conservation, Rs 1.52 crore was by way of public contribution. People's participation The success stories of these schemes are many. Villagers of Baria, under the Mahabhagirathi scheme, contributed free labour for cleaning and increasing the depth of the spring pool, the only source of drinking water for the village. They also built a pucca lining for the pool and installed a water tank. In Nalchha village, desiltation and digging deeper tanks have recharged wells downstream. "While some villagers have given their labour, others lent their tractors to dig the soil. The panchayat only worked as a facilitator," says Hemant Jain of District Rural Development Agency ( drda ), Dhar. "Earlier, there wasn't enough watering holes for our animals but after these tanks were dug they could easily find water," says a villager. The total number of work in Dhar, including all construction activities, is 3,269 that is valued at Rs 7.22 crore. rtrwhs has been been started in Dhar since April 2000. In Mandsaur, coloured signboards of 'Jal hi jeevan hai' dot the roads. This year the rainfall has been 430 mm only (till September) as compared to the normal of 762 mm. Mandsaur is agriculturally richer than the other two districts. However, it has acute water scarcity. The district has the highest number of tubewells in Malwa and those who have water in their wells sell them at a price. Here, too, the rtrwhs has been used with sucess but at a smaller scale. An excellent example of tank renovation can be found at Ristal where a 14 th century tank has recharged wells six to seven km downstream. Historical records say that Prakashvardhan, father of Harshvardhan, built the tank after he won a battle against the Huns. The capacity of the tank after the renovation increased to 1.1 mcum. The gram panchayat gave Rs 1.85 lakh and the people contributed Rs 2.15 lakh towards its renovation. "The irrigation department would have taken Rs one crore to do it," says A Jain, collector, Mandsaur. Many of the private lands had been inundated during renovation. In Barujana block, a tank worth Rs 12 lakh has been built and 62 farm ponds called pokhars have also been constructed that have recharged 62 wells. "I have recharged my well by digging a small area where rainwater can accumulate and have linked it to the well via a filter. The water-level in the well has gone up. Now I am cultivating groundnut, makka (maize), opium, gehu (wheat) and lassan (garlic)," said Kunwar Lal, a farmer. After the first rains there has been an increase in 3-3.6 metre of water in the well. In Narayangarh, 20 villagers lent out their tractors daily to build a pond. Another tank has been built at Rooparel village under Magrana panchayat in just about one month where the villagers paid Rs one lakh, the government contributed Rs 1.7 lakh and the panchayat Rs 50,000. The length of the pond is around 95 metre. In the Magrana village, 200 pokhar s have been built. The sarpanch said two more talab s will be built. "The water situation was so bad that we used to lock up water in our houses. Till last year water had to be transported but we hope the situation will improve." The total cost incurred in these programmes is Rs 79.25 lakh. Of this, Rs 61.58 lakh has come from jan sahyog . The total area under irrigation covers 3,660 hectare and total water storage capacity would be 6 mcum. Industrial houses have also shown interest in these schemes. Mid India Limited solved the water problem in its officers' colony through jan sahyog. It built a pond on government land and is building another downstream. Other companies are following suit.